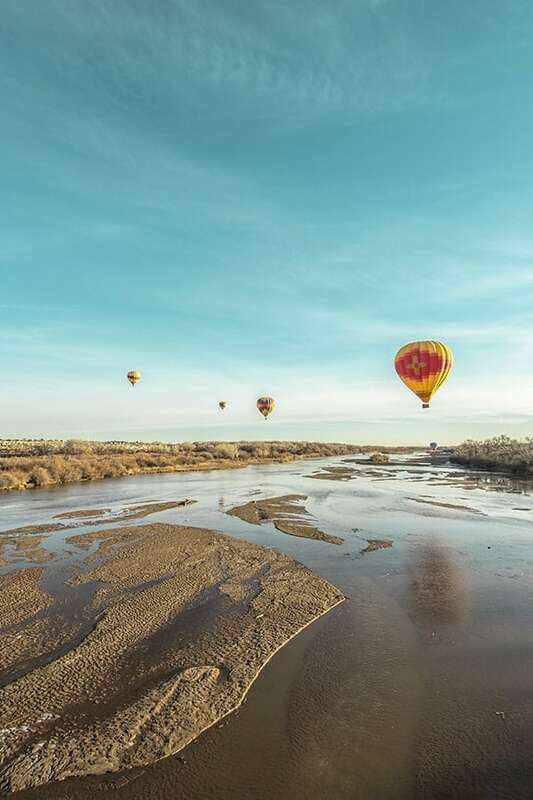 Your ultimate Albuquerque travel guide – here is my list of the 10 best things to do in 24 hours! Last month I traveled to Albuquerque for the first time. Not only was this my first visit to ABQ but it was my very first time in New Mexico! For years I have heard people rave about the regional cuisine, the warm climate and beautiful landscape so I decided it was time to see it for myself. 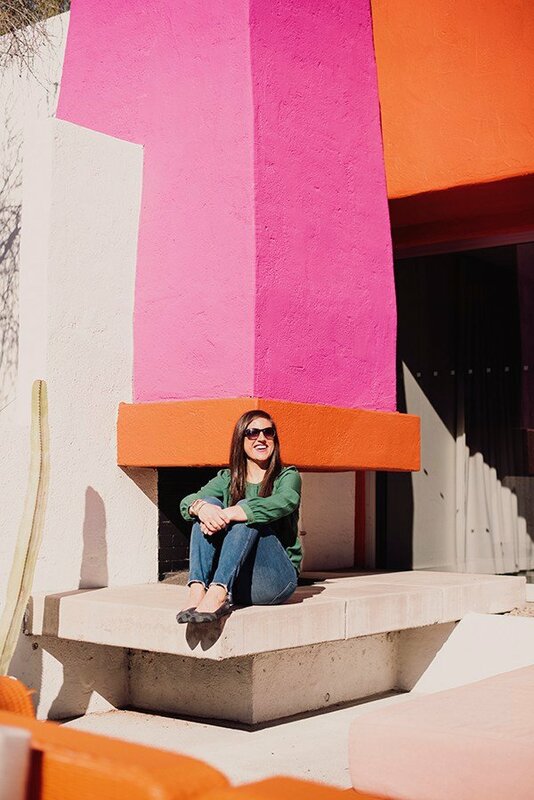 Without further ado, here is my ultimate travel guide to 10 things to do in Albuquerque in 24 hours! 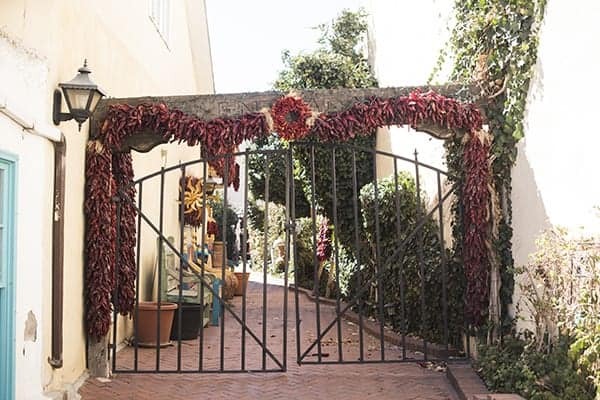 Check-in to Los Poblanos Historic Inn & Organic Farm upon arrival. 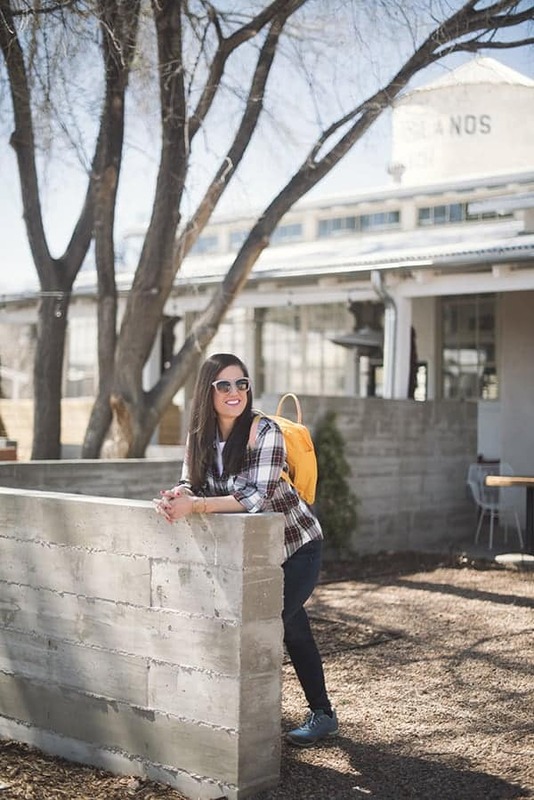 Situated amongst 25 acres of lavender fields, enormous cottonwood trees and formal gardens, I felt relaxed from the moment I stepped out of my car at Los Poblanos. This working organic farm has 50 guest rooms, all of which offer walk-out access to the gardens. 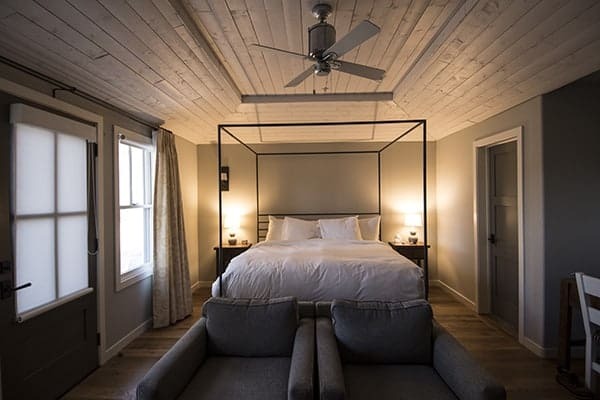 Each room features hard wood floors, original artwork and carved ceilings, creating a peaceful retreat for each guest. 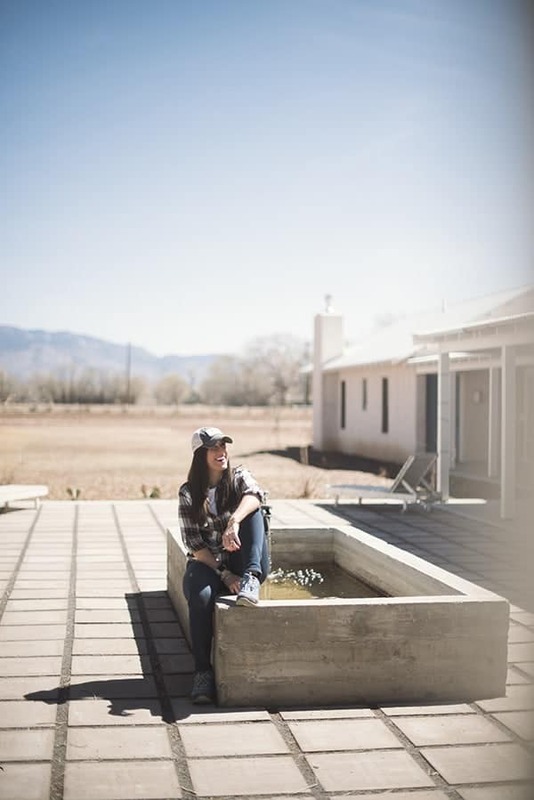 While there wasn’t much garden activity going on during my late-winter visit, I still couldn’t help but smile when I felt that warm, New Mexico air and sunshine on my face. 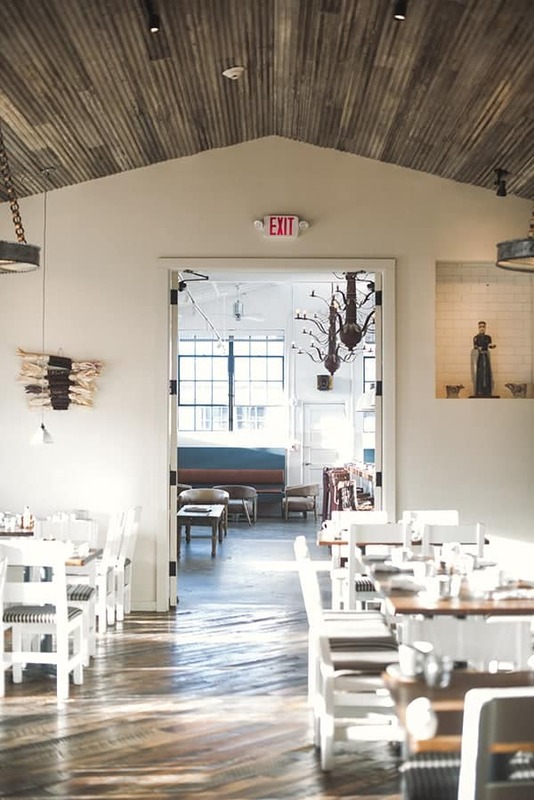 Campo, the restaurant located at Los Poblanos, is a beautiful spot for breakfast, lunch or dinner. Be sure to check their website for dining hours as they don’t serve dinner nightly. 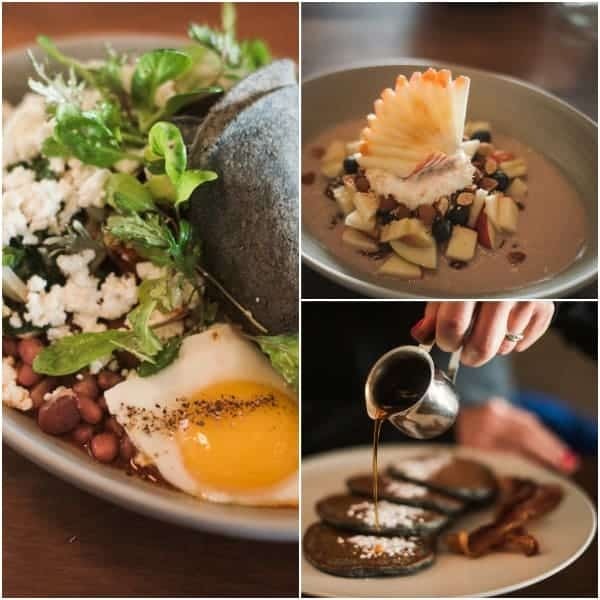 If you see the blue corn pancakes on the menu, be sure to order them. I also highly recommend the breakfast skillet with steak and beans topped with queso fresco. 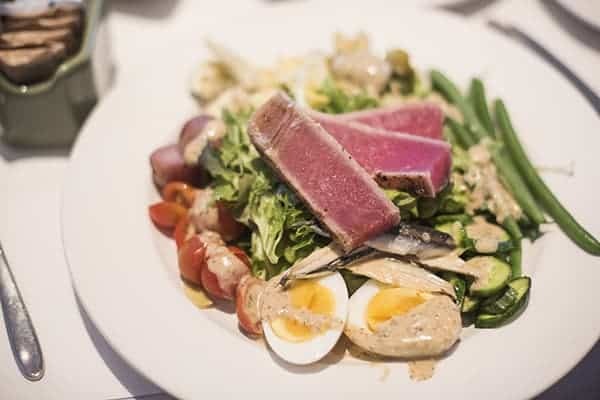 Head Downtown for Lunch at The Artichoke Cafe: Rated one of the top fine dining restaurants in Albuquerque, I highly recommend the fresh salads, pastas and sandwiches. 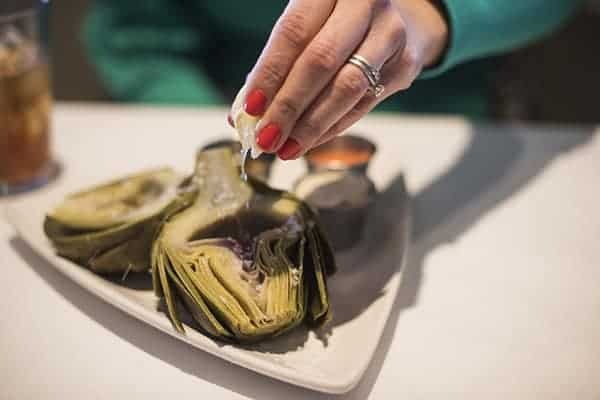 Of course, no visit to The Artichoke Cafe is complete without trying the steamed artichoke appetizer served with a lemon sage butter and bacon-thyme aoili. 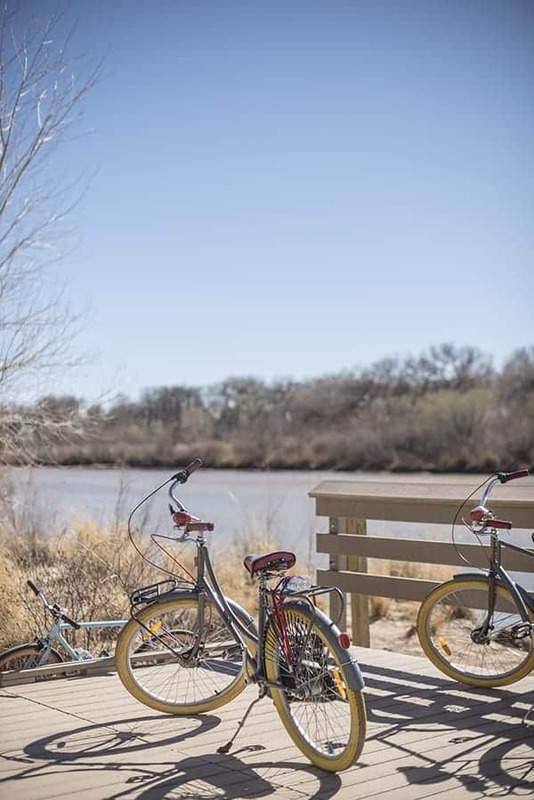 Burn Off Lunch with a Bicycle Tour of Albuquerque: Routes Bicycle Tours & Rentals is a fun, easy and safe way to explore Albuquerque. 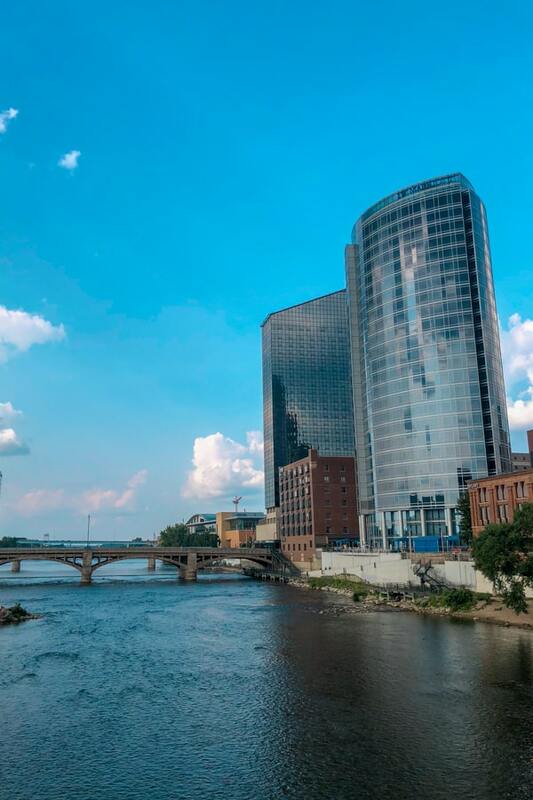 Ideal for people of all athletic abilities, this casual tour is a great way to try local cuisine, learn more about the history and get to know the area. 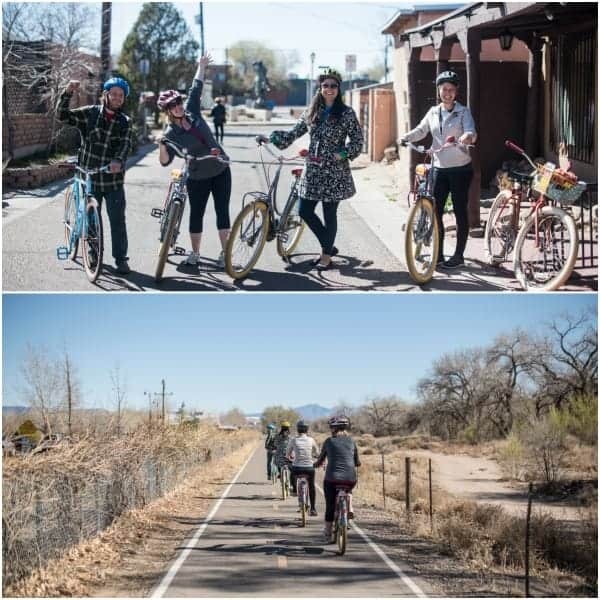 Whether you choose the New Mexico Chili Bike Tour, the Winery Bike Tour or the Brewery Bike Tour, this is something for everyone. 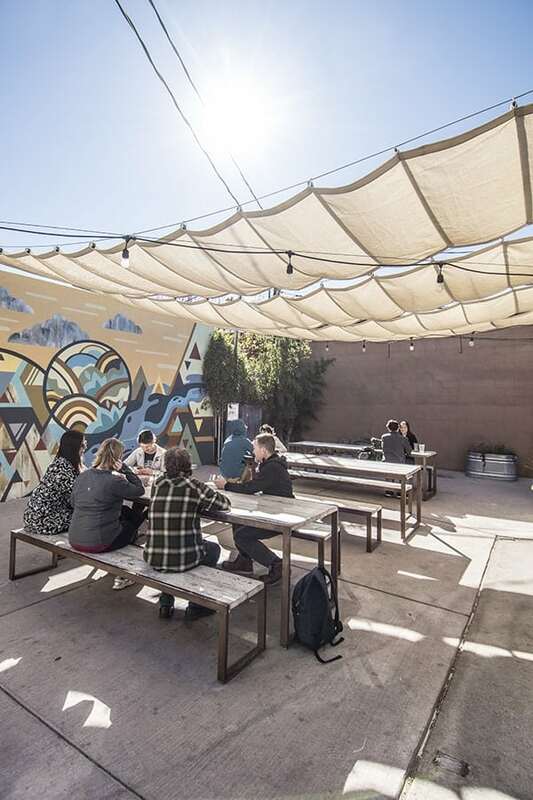 Sample Beer at the Local Breweries: Albuquerque offers no shortage of local breweries but two that I really enjoyed are Sidetrack Brewing Company and Monks Corner Tap Room. 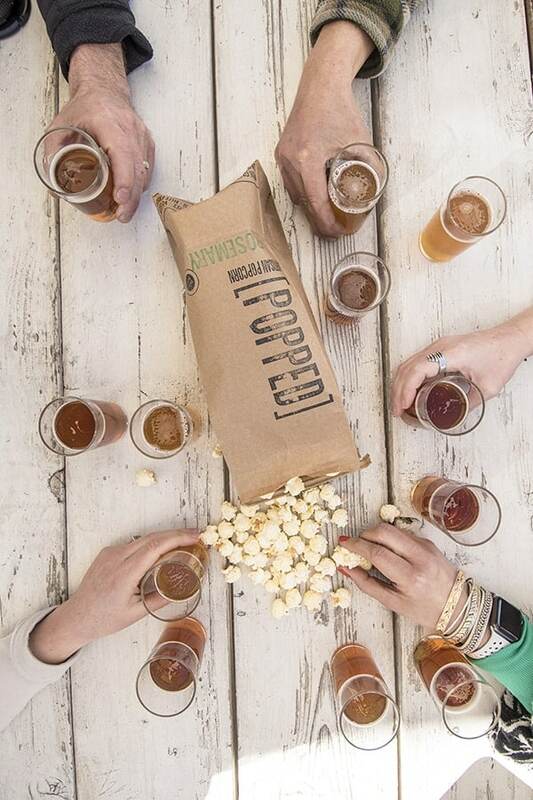 Pro Tip: Ask your waiter at Sidetracks to bring you a bag of the herb-infused craft made popcorn. It is off the chains delicious! 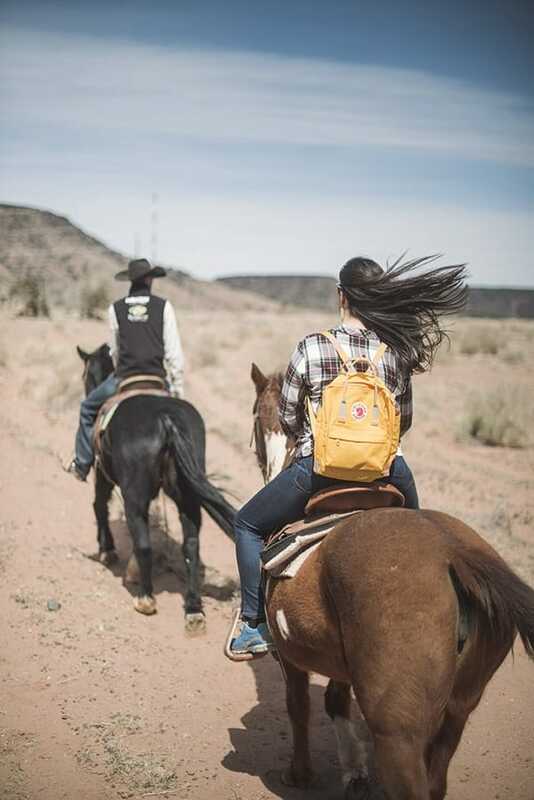 Enjoy a Horseback Trail Ride at Hyatt Regency Tamaya Resort & Spa: As you may recall from my visit to Tucson, I absolutely love horseback riding. 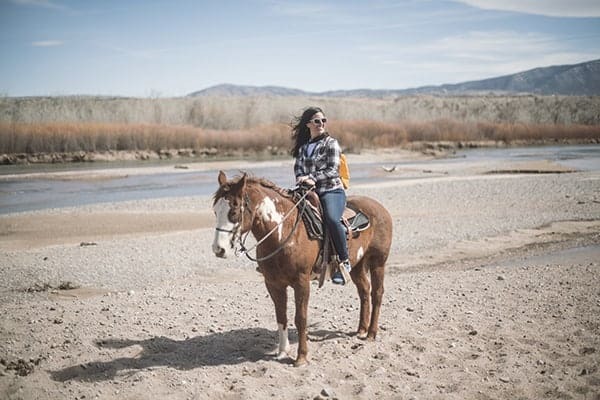 It’s not something I get to do every day so whenever I visit a region with beautiful horseback riding trails, I try to take advantage of the opportunity. The tour guides are so helpful and informative. What’s even more special is that over half of the horses are rescue animals from the Tamaya Horse Rehabilitation Program. 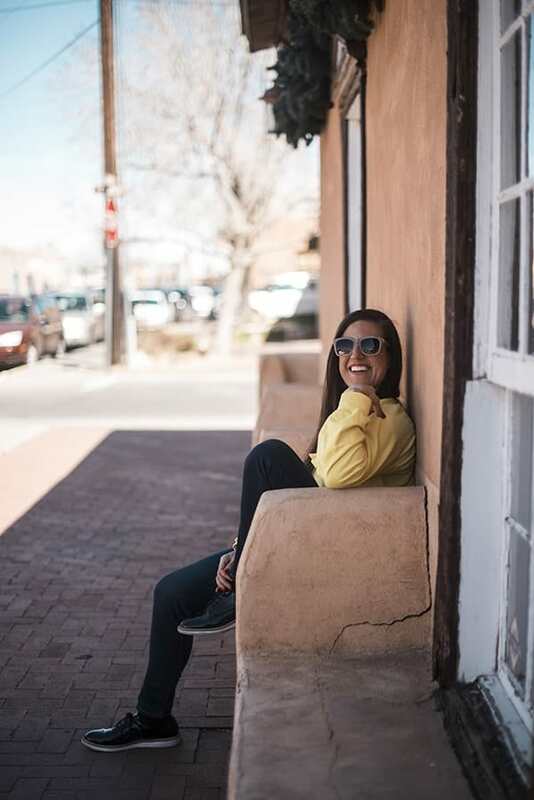 Explore, Shop and Eat in Albuquerque Old Town: Whenever I travel to a warm weather climate, I like to spend as much time outdoors as possible. 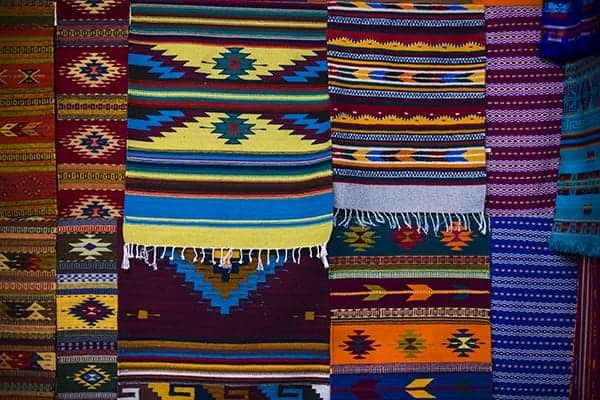 Albuquerque Old Town is the perfect neighborhood to explore for unique shops, gifts to bring home and delicious cuisine. 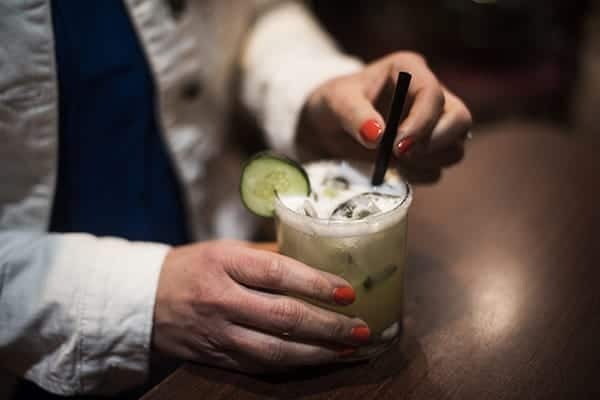 Grab a Bite to Eat at Garduño’s at Old Town: If you’re looking for a snack, a happy hour cocktail or a full meal, I highly recommend Garduño’s at Old Town. Hands down, it was the best salsa I’ve ever tasted and the margaritas also pack a punch. 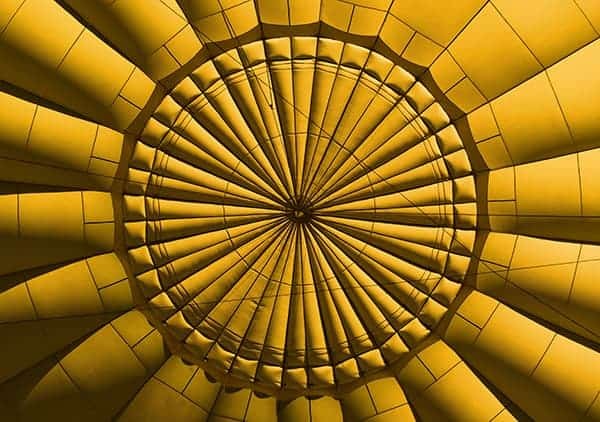 Go on a Hot Air Balloon Ride with Rainbow Ryders: You can’t visit the hot air balloon capitol of the world without going on a hot air balloon, am I right? 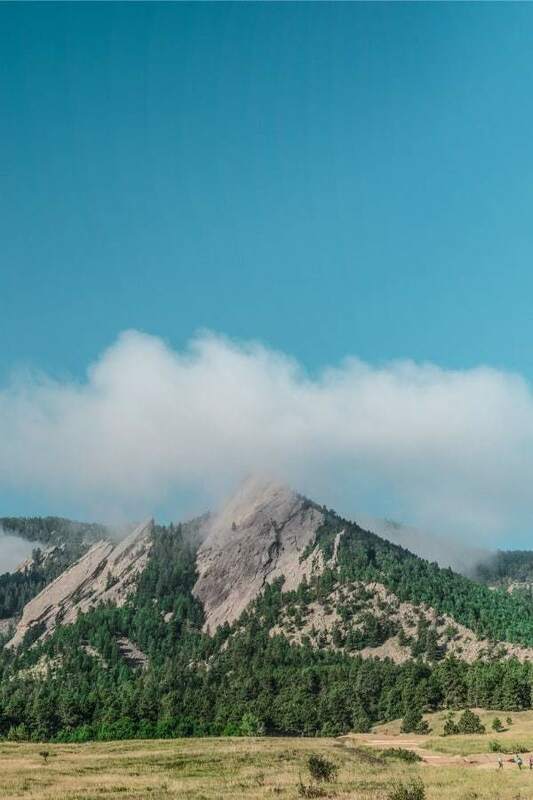 This was my very first time going on a hot air balloon ride and I could not wait to check this off my travel bucket list! I’m thrilled to report it exceeded every expectation and was by far a highlight of my visit to Albuquerque. 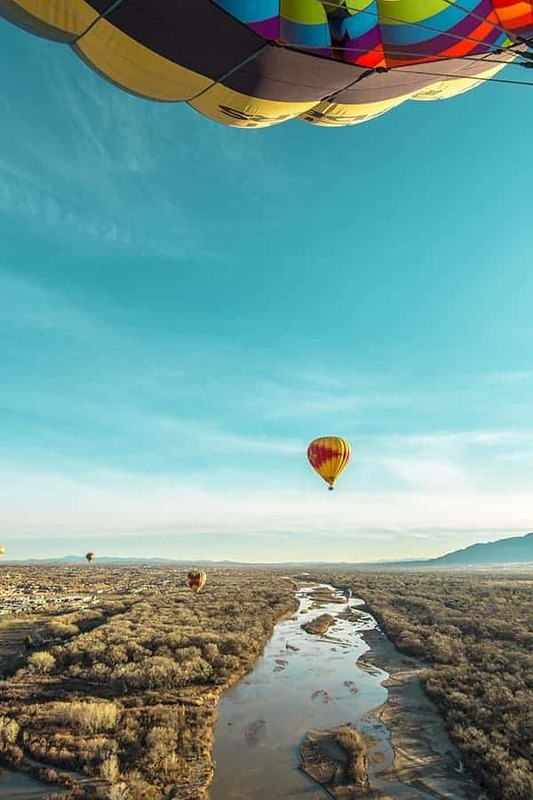 Hands down, you must go on a hot air balloon ride the next time you’re in ABQ. 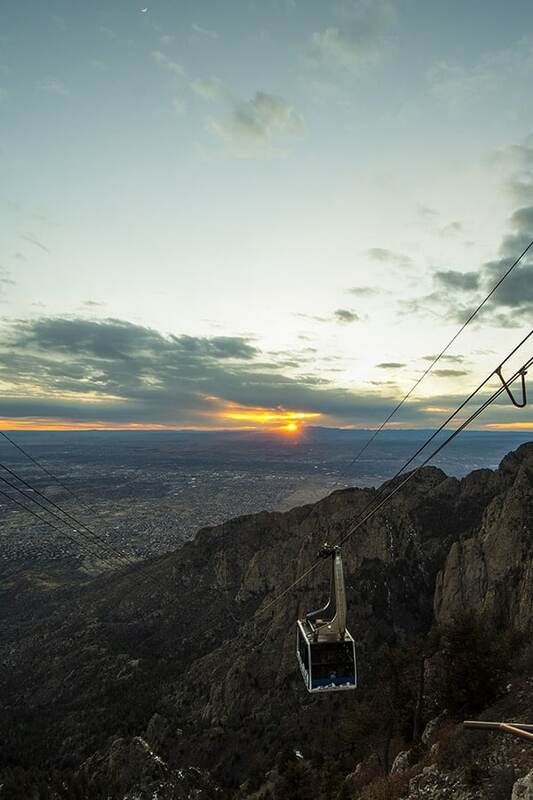 Catch the Sunset on Sandia Peak Aerial Tramway: Ascending more than 10,000 feet up into the sky, you can’t miss the breathtaking views from the top of Sandia Peak. Just a word of caution: the temps are about 10-20 degrees cooler than ground level so be sure to bundle up a bit so you can stand outside to catch the sunset. 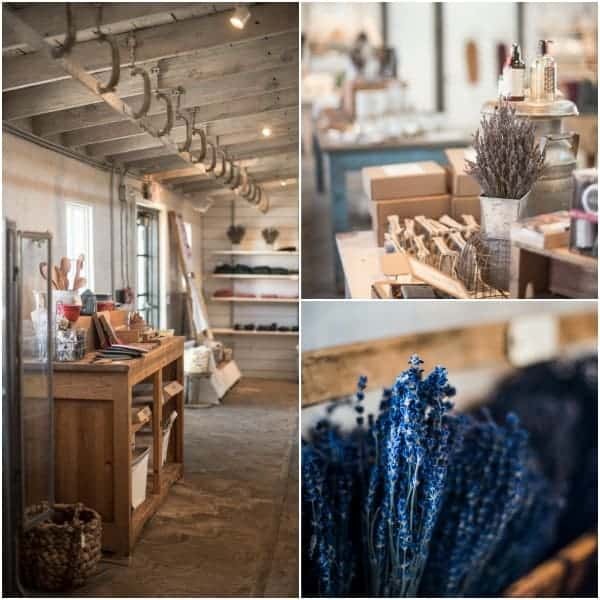 Grab a Souvenir and Cup of Coffee at Los Poblanos Farm Shop: Located directly on the historic ranch at Los Poblanos, the farm shop is filled with lavender infused gifts such as bath oils, lotions, soaps and more. Of course, all made with the organic lavender grown on site. You can also find a wide variety of locally produced foods and other goodies to bring home. 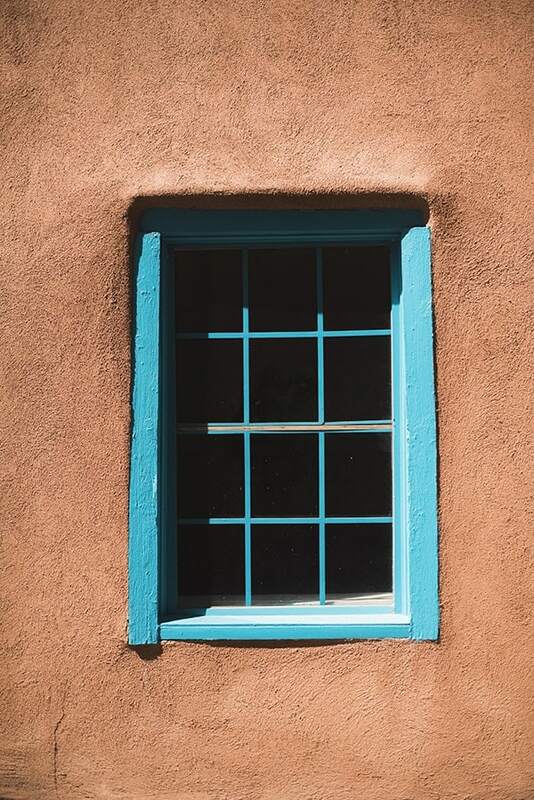 Stay tuned for my next guide: Santa Fe! Trust me, you won’t want to miss this one. In the meantime, let me know where you’d like me to travel next. 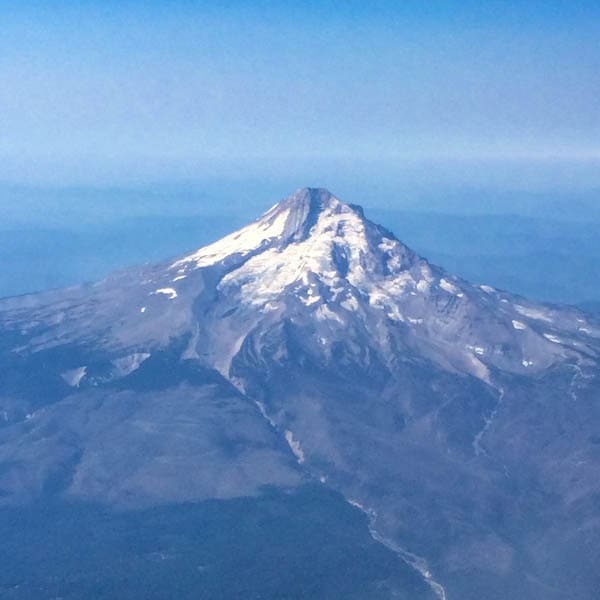 Take a look at some of my other travel posts for inspiration. 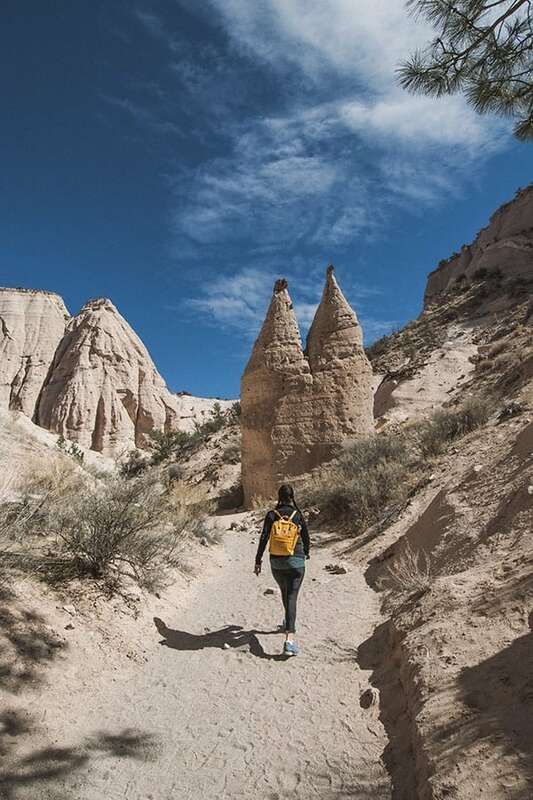 I’d love to help you plan your next adventure! 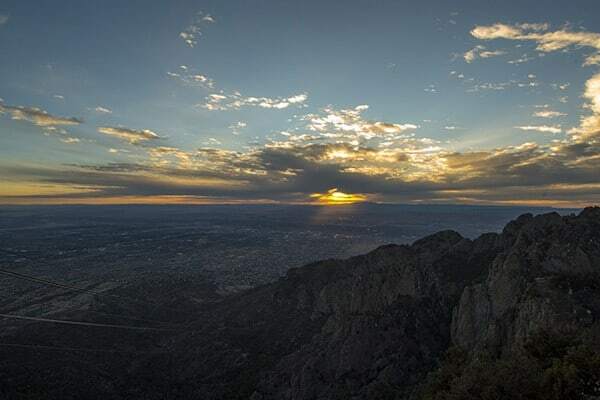 Disclosure: Visit Albuquerque coordinated my hotel, activities and meals during my stay. Photography by Alejandro Photography. I was not compensated to write this post. All thoughts are my own. This is hilarious!!! Thank you for all the insider!!! Yes I love Union Oyster House!! 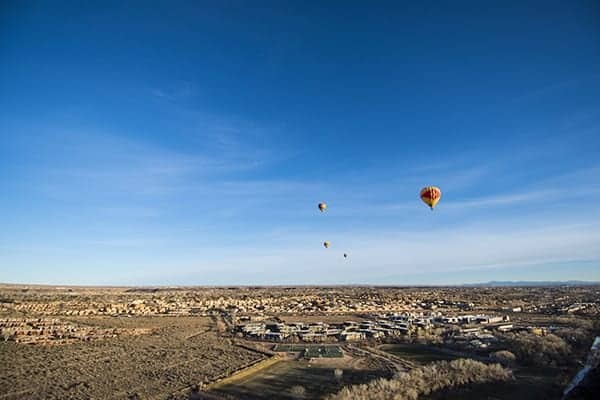 I live in Albuquerque and am so glad you loved this city! We have so much cool stuff to do. Next time you’re in NM, head up to Santa Fe and check out Meow Wolf! I actually drove to Santa Fe and will be sharing a story about it this upcoming week including my visit to Meow Wolf!! How could I miss it?! This looks so amazing, I am looking for our next big family trip and this one might be it! You would love it!!! So much great food! You always know the best things to do! I’ve never been to NM. It looks like a fun place to visit! 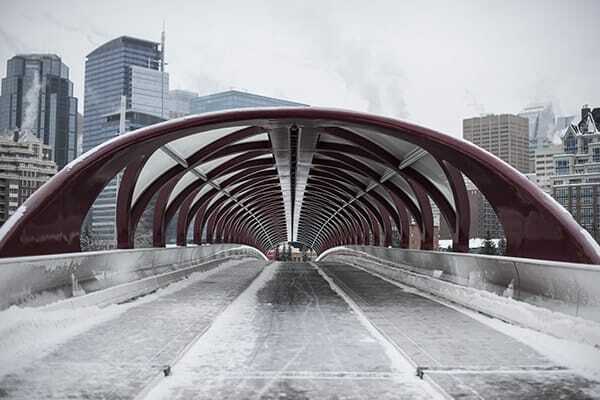 It’s so beautiful and you can’t beat the climate!